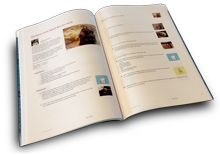 Order a professionally printed, perfect bound cookbook with a full color glossy cover and 26 recipes. Ronda, I love the collection of these cookies!! Thank you so much for including my recipe! Jen , really nice cookbook . A great collection of delicious cookies!! thanks Im glad you like it, this is alot of fun and I have so many recipes to share.